Cave Creek Bike Week is Coming Soon. March 29th – April 7th – Will the new Council let the biker bars move their parking lots on to the only public road through Cave Creek? What does it take to own Cave Creek for 11 days? Just cut the town a check for $100 and scream “we pay sales taxes.” Voila! You are able to close 2-lanes of traffic for motorcycle parking during tourist season on the only road through Cave Creek. The two primary advocates for the 11-day Bike “Week” are the Hideaway and Roadhouse, the two biker bars along Cave Creek Road with the same ownership. Clearly, the Cave Creek Mayor and Town Council are not listening to and representing their primary constituency – you! Cave Creek residents support community based, family oriented and public events with a shorter duration, such as Fiesta Days and Wild West Days. They do not support biker bars, which are private businesses, seizing control of the only road through Cave Creek for a motorcycle parking lot for days on end. In fact, for 11-day Bike “Week” 2019, the Hideaway and Roadhouse will be allowed to close lanes on about a 1-mile stretch of Cave Creek Road on March 30 and 31 and then again on April 4, 5, 6 and 7. That is unless you, the Cave Creek voter, stop them. Kevin Price, the manager of both the biker bars stated last week on FaceBook, “The town of Cave Creeks (that means you the voter) decision on voting ballots disagreed with your opinions by choosing the current council and mayor.” I could not have said it better. Two biker bars own your town government. Not only are these biker bars closing your public roads, they had the brashness to get operating permits with inadequate parking (Hideaway) and expand their business by illegally building on the Town’s (your) property. And the Town, foolishly, let them get away with it. When asked about this, the response from Cave Creek Town Hall was dumbfounding “Refer to the patio that was built and removed at the Roadhouse. I voted to not have it removed in 1 to 6 vote (I lost). Through watching many episodes of the show Bar Rescue I believe that lease could have returned in the neighborhood of $10,000 annually.” – Ernie Bunch, Mayor (regarding the illegal Roadhouse patio, not the remaining illegal water tower sign). The clarion call from the biker bars and the justification from your town government is sales tax revenue. The unsubstantiated claim from both the biker bars and Town Hall is that there is a “spike” in sales tax revenue. That “spike” amounts to less than $4,000 per day. At Walmart, that is equivalent to 1-hour of sales on a Saturday afternoon without closing a single lane on Cave Creek Road. In fact, biker bar management said on FaceBook, “I can assure you there is an undeniable spike in dozens of businesses through the town from Walmart to Dairy Queen.” Yesterday, I spoke to one of the largest commercial property owners in Cave Creek and was told that the value of Bike Week is somewhere between a negative and zero in terms of impact on business. Many other small businesses along Cave Creek Road experience a similar negative impact. Are you going to sit in traffic for a half-hour to get your car washed, then another half-hour to get home? I think not. The most impressive, delusional and grandiose claim was the biker bars taking credit for a spike in business at Walmart 4 miles away. I’m certain the Walton family in Bentonville is grateful! So why don’t the Hideaway and Roadhouse just use their own parking lots? Because they lease their parking space out to white-tent vendors. The 11-day Bike “Week” in Cave Creek and the closing of 2-lanes of Cave Creek Road are not mutually exclusive. The event can take place. The biker bars can sell their products and use their own parking lots. 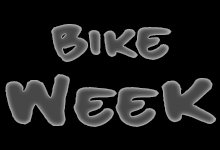 The debate on this issue is not about ending Bike Week in Cave Creek. This is about using the only public through street in Cave Creek as a parking lot for the benefit of two private businesses. The biker bars and their 10 FaceBook supporters (half are not Cave Creek residents) become aggressive, nasty and threatening when confronted with the facts. Are these the kind of people we want running the Town of Cave Creek? John Hoeppner served on the 1985-86 Cave Creek Incorporating Committee and twenty-years of service as the Republican Cave Creek Precinct Captain and State Committeeman. John is recognized worldwide as a leading expert in the discipline of brand research and development. He has received five prestigious AMA Edison Awards for domestic and global Fortune 500 clientele.